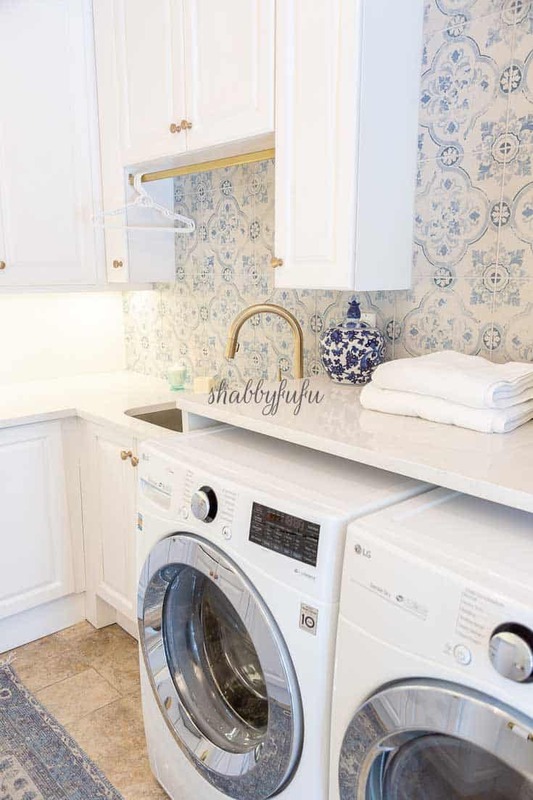 In this post I’m revealing my stylish functional laundry room done on a budget and tips on what I saved on that you can use in your laundry space! 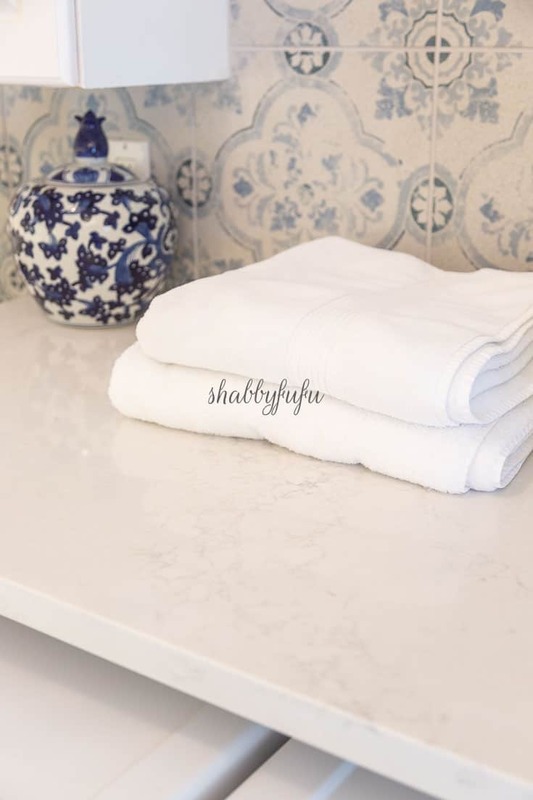 This post is sponsored by Birch Lane and Hanstone Quartz. All thoughts and photography are honest and my own and are not influenced by my sponsors. Thanks for supporting the brands that support this blog. With all of the renovations that we have done in our home over the years, I am most excited about our new laundry room! It’s hard to believe that this room was originally an awful looking outside photography studio addition from a previous owner. I wish that I had some photos of it back in the day to share, but that was prior to the iPhone era or DSLR cameras for that matter. You can see more of it in the before photos in THIS POST, where the wall was broken into to access the plumbing. This room has to serve as a multi-purpose room with storage and a half bath as well. There is no window with mechanical on the wall outside, but it has a view being right off the pool from the doorway of the room. We worked with what we have (as we often do) and planned on ways to save money where we could. As with any addition or renovation there are bumps along the way, and it’s not like you see on Fixer Upper or HGTV! 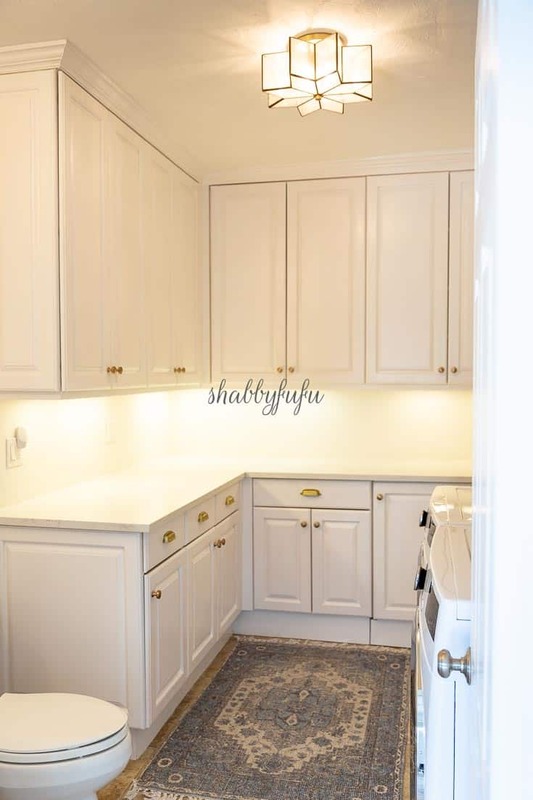 In planning (more on THIS POST) we knew that we could keep the cabinetry that we added about 15 years ago and simply give it a fresh coat of paint. We did remove a bank of cabinets that were around the previous washer/dryer and the only one that I feel badly about losing was the broom closet. Brooms and mops are now temporarily related to the garage until we find a better solution! As mentioned this room is multipurpose and we kept the toilet and pedestal sink. My husband is a general contractor and has never seen a laundry room set up this way, but we really needed this set up with limited room to expand. We also kept the tile flooring that is in a large part of our home and in great condition. 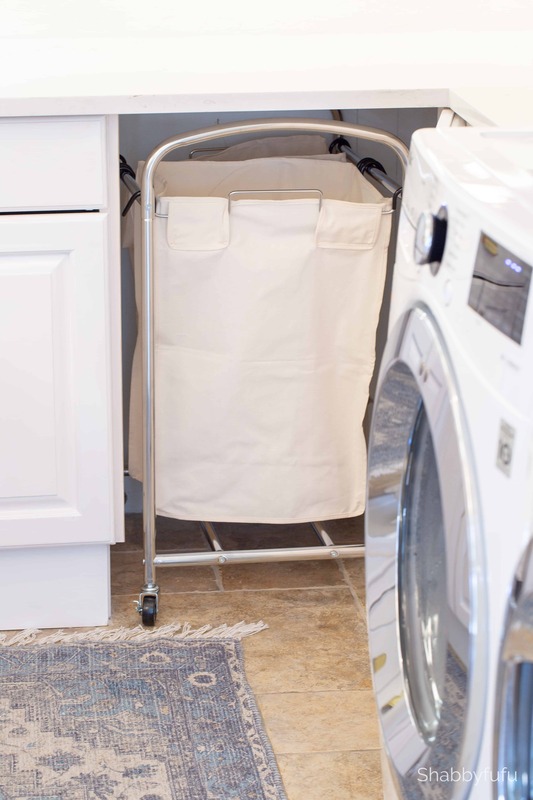 We re-designed an existing cabinet to hold a hidden laundry basket that pulls out on wheels. The existing high end stainless steel laundry sink was something that we decided to keep as well. 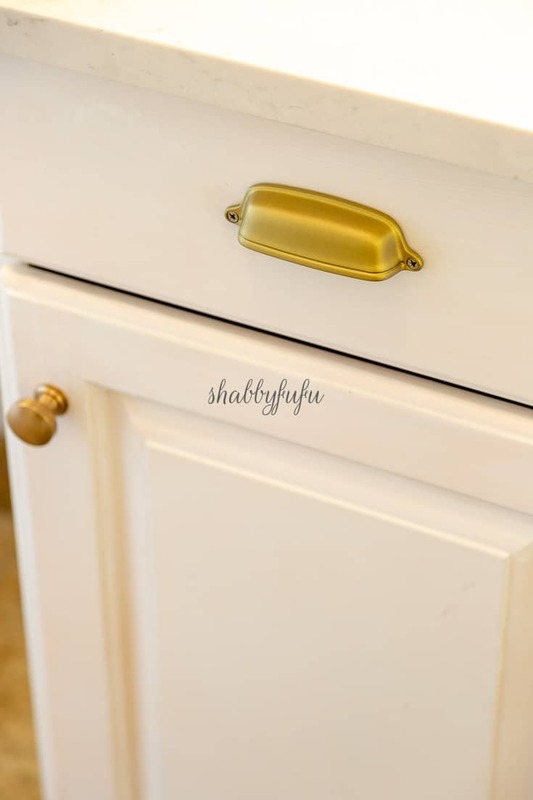 We kept the bin pulls on the drawers and I spray painted them gold, as well as the toilet tissue holder and the hanging rack over the laundry sink. Spray painting several of the items saved us some money and it honestly was easier than replacing them! 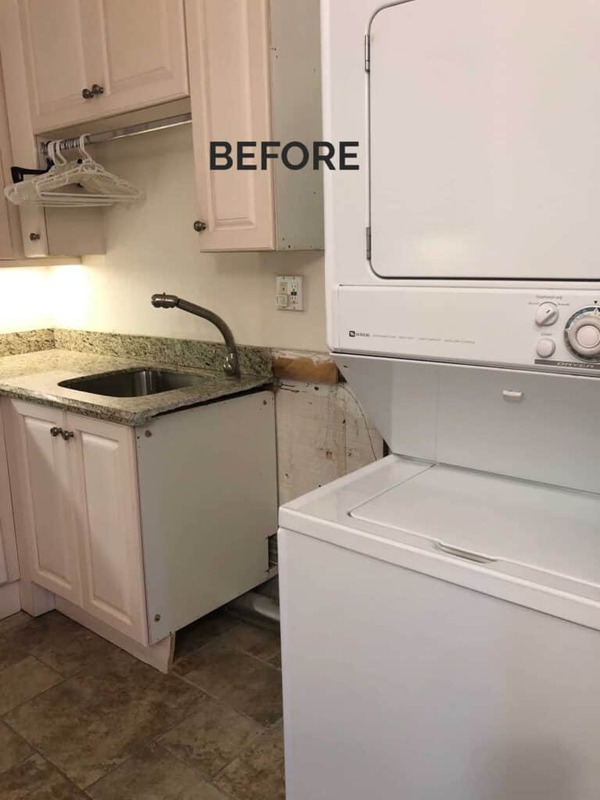 So…what DID we replace to get this stylish functional laundry room look? Some of the basics and you might be as surprised as I was to learn that Birch Lane carries items for home renovation as well as decor! The new washer and dryer needed to be full sized and I designed a tile wall behind the space as an accent wall. This is truly the star of our new stylish functional laundry room, and the tile is just as beautiful in person as it is in the photos! Blue is such a calming accent color and with the coastal location of our home it goes so well. I’ve seen my share of rooms with similar tile, but it’s almost always in black and white and generally on the floor. I wanted something different and not trendy…so this is what I chose to do. We may add a couple of floating shelves at some point, but I’m living with it for awhile first to see if they are necessary. Obviously I don’t rush into decorating decisions if it took me so long to redo the room! For a modern feeling I went with brushed gold hardware and lighting. I just LOVE how it instantly updates this space! Having worked with my friends at Delta Faucet several times I knew that I love the quality of their faucets and chose the Trinsic Faucet in Champagne Bronze for the laundry sink. The pedestal sink was updated with the Delta Faucet Cassidy in Champagne Bronze and it’s a faucet that is our go-to in both of our homes and our business too. 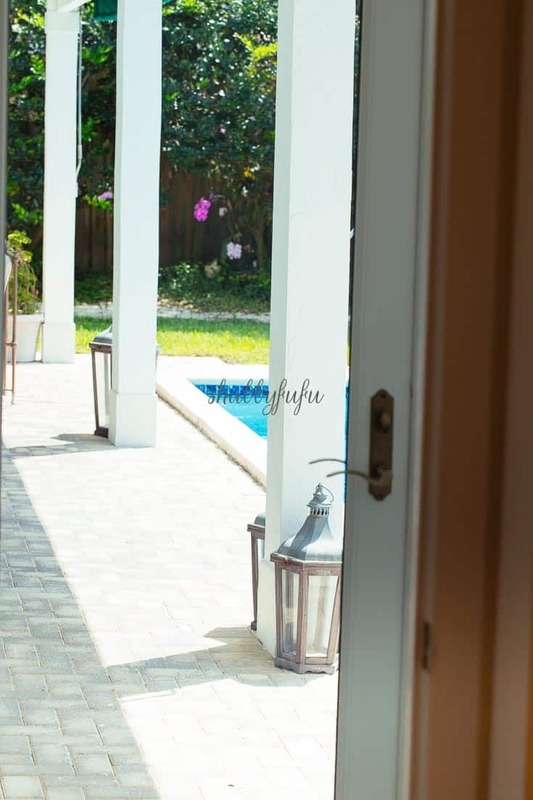 I’m linking everything that I can in this post if you’d like to learn more and possibly shop these products for your home. Our countertops came from my friends at Hanstone Quartz and I honestly cannot say enough about the quality of their quartz products! You can learn more about it here in my KITCHEN REVEAL post. It’s the Hanstone pattern MONTAUK that we’ve used in the rest of our home and part of their BOUTIQUE COLLECTION. The Montauk is subtle yet luxurious in a soft pearl with marble veining running through. I just LOVE it! Function along with being stylish is how I roll in decorating any room. I’ve mentioned before that I have a self imposed rule of adding something vintage to each room. Timeworn pieces add that special and unique feeling to a room and will distinguish it from the pack! In this room I kept the vintage mirror over the sink, that is actually a gesso photo frame that I picked up years ago at a flea market and painted white. I had the mirror cut to fit and you could easily do this with any frame too. 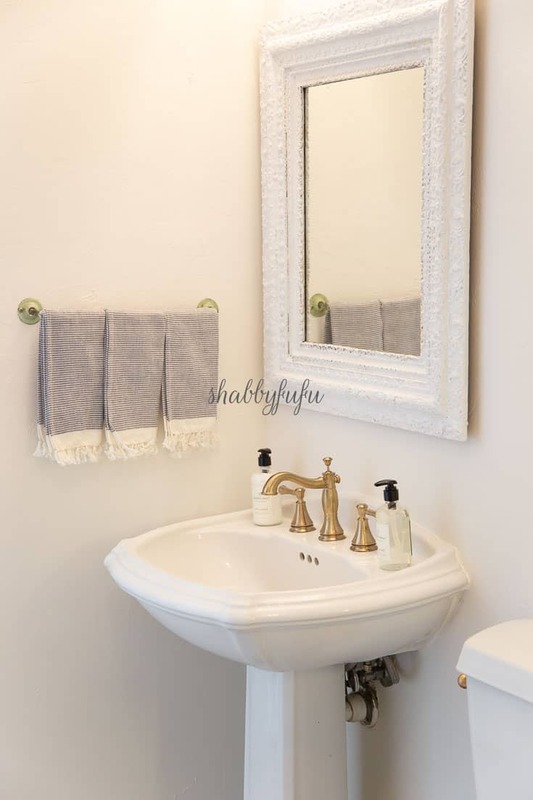 The towel bar is also vintage and has a glass rod to hold the towels with old green paint on the finials. I couldn’t be more pleased with my newly remodeled laundry room and I hope that you love it as much as I do! Will I enjoy doing laundry in here? I actually don’t look at laundry as a chore and with these updates I think it just may be fun! Please let me know in the comments if you have any questions about the products or the process. SHOP THE POST BY TAPPING ON ANY IMAGE BELOW! Lovely I especially love the tile back splash! Janet…this is the laundry room of my dreams! That tile on the wall is gorgeous! And having the counter over your washer and dryer adds so much functionality! Pinned fo my future reference. Thanks for sharing the fruits of your (long) labor. Thanks Lynn, I appreciate you visiting my dream laundry room! It’s absolutely beautiful!! I really love the way you repurposed what you had and then added gorgeous finishes like the gold and champagne bronze. Redoing our laundry closet/pantry is my next big decision also. I’ve been so busy doing projects, I haven’t been on here. Love the blue! Thanks for sharing! Hi Babette…thanks for stopping by! Hope you garner some inspiration here for your laundry space. What a beautiful space. The tile and the gold finishes are gorgeous. Where did you get the vintage looking rug? It ties everything together perfectly! Oh! This is lovely! A room like this would definitely make doing laundry lots more fun! Thank you Sheila…it IS more fun now! Love your new room, especially the tile and light over the pedestal sink! How is the shelf installed? It is so big but looks like it is floating. Thank you Pam! The shelf is installed on a ledger strip, which is basically a hidden strip of wood that the shelf sits on. You chose well Janet, you’ll never get tired of those beautiful tiles! I would have picked them also. Thank you Catherine…so much nicer doing laundry in here now! The tile you picked is perfect! What a difference and so stylish. Congrats on your new laundry room Janet. I can’t tell you how in love I am with that tile! I mean seriously the most beautiful tile I have ever seen! Your entire makeover is spectacular! Janet, no wonder you are excited about this make over. It’s besutiful! I love the European feel of the tile. I’m inspired and motivated to at least paint our tiny room. We stole it to make an attic staircasewhen renovating. Functional but tiny. And can and should also be beautiful! Have a good day! Janet, I am fairly new to your blog, but you are such an inspiration, and I appreciate all of your ideas and creations, and access to your free printables. The laundry room makeover is amazing. I especially love the tile too. Would you share which gold paint you used to paint your hardware? Finding the right gold paint is always a challenge. Janet, it looks fabulous and I absolutely love the gold details. Mixed with the lovely blue tile it’s perfect!! Thanks Lory…I’m loving it and it’s so functional now as well! Thanks so much Jayne…really appreciate your kind comment! Thank you Christina…I’m in love with the room now! Love, love the blue tile! Has a vintage look. Great idea for an accent wall in this room. It all looks wonderful….but, I’m not a fan of the bronze handles, faucets, light fixture, etc. Prefer to use classic stainless steel hardware, so that they compliment the sink and laundry machines. Wow, Janet… Just WOW! You did a lovely job, and I really am impressed with how many items you kept and/or upcycled. 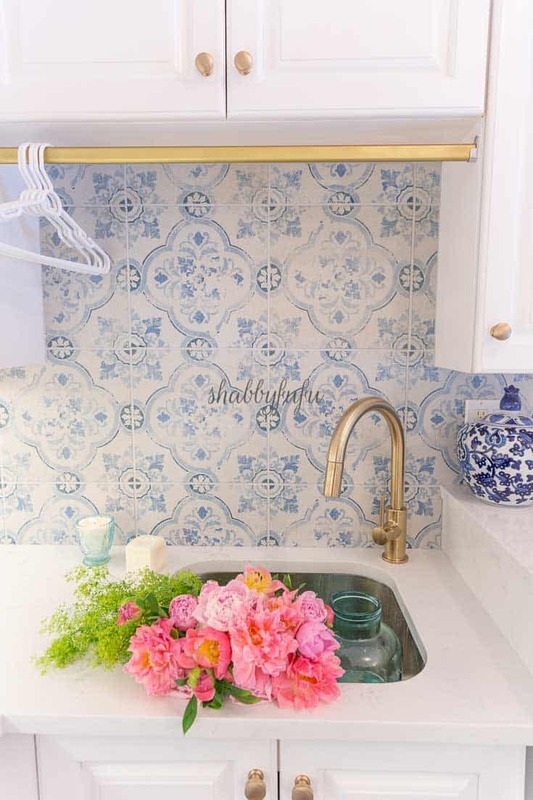 Love that backsplash… the blue definitely adds a touch of coastal vibe. 😉 Thanks for sharing! Pinned! Love the blue and white tile, and how well it goes with your rug! Great reno! First, I must say that I would like to buy your house if eveah! Second, I love this multifunctional, stylish and efficient laundry room you have created. So much better, and a what a pleaseure to be folding and doing laundry in this room. Thank you Deborah…it truly is a pleasure to work in the room now and on to the next project! What a transformation…beautiful Janet!!! 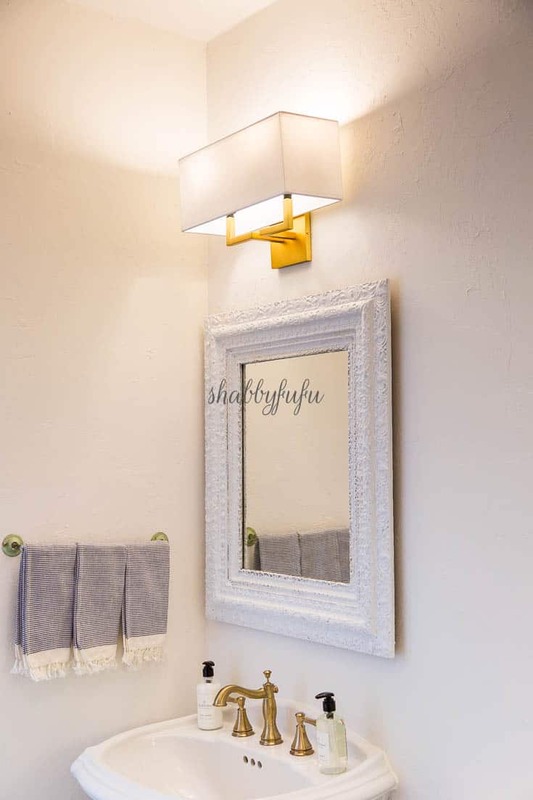 My son’s first home had a powder room/laundry room combo……you transformed yours into a swan!…love the gold details and will have to looking into the Hanstone quartz as it is time that I start making a decision on my countertops…. Thanks Shirley! The tile and details make a world of difference for sure and I can’t recommend Hanstone Quartz highly enough! Beautiful, I love all things blue. The tile is so pretty. Love the new laundry room!!! Stunning Janet! That backsplash is gorgeous. I can imagine spending in time in the laundry room might not be so much of a chore now! Thank you Maureen! I enjoy the laundry process actually and this will make it a joy! Janet, love the remodel especially the countertops and tile! You are a lucky lady to have a wonderful husband to go along with your ideas! Thank you Norma! We compromise and it’s not always easy having a contractor for a husband I must say. LOL!! Thank you Michelle…I’m in love with it now, but definitely waited a long time to make it over! I have seen that black & white tile that you speak of and I’ve seen it WAY too much. 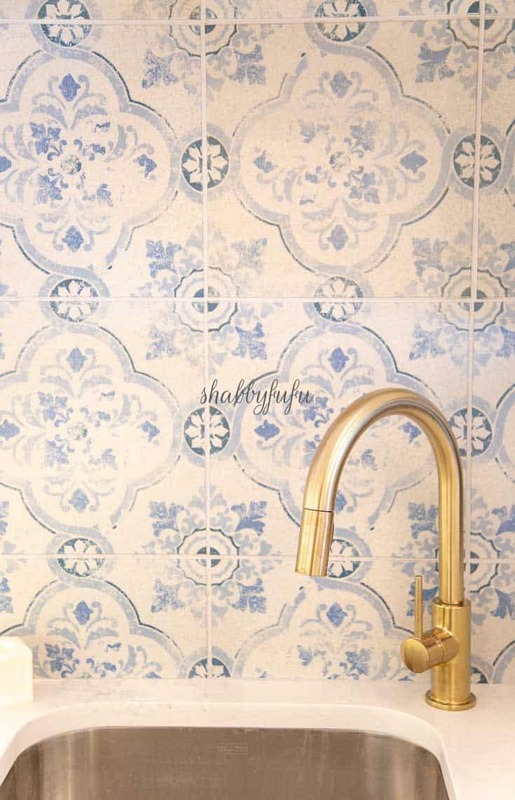 I prefer to be more unique than that and I absolutely LOVE the blue & white tile you picked out. Your laundry room was definitely worth waiting for. Too trendy and farmhousey for my taste and I like to be different! Thanks for stopping by! Janet, well done! I have never seen such a multiple use room so cleverly styled. I’m curious to see your your solution to mops and brooms. Thank you for sharing all your great ideas! It’s so hard to pick a favorite in this wonderful makeover. Especially loving the blue and trying to convince myself I need more blue in my home. Just gorgeous as usual. This is really beautiful, I love your choice of backsplash tile! I just love how your laundry room turned out, Janet. It really is stunning. The blue and white with the gold accents just pop. That wall tile is amazing! Thank you so much Tara! Today is laundry day and I find myself loving being in there! Happy spring to you and this room turned out great! Thank you Barbara! The Hanstone quartz is great quality and I love how light and bright our rooms look now! 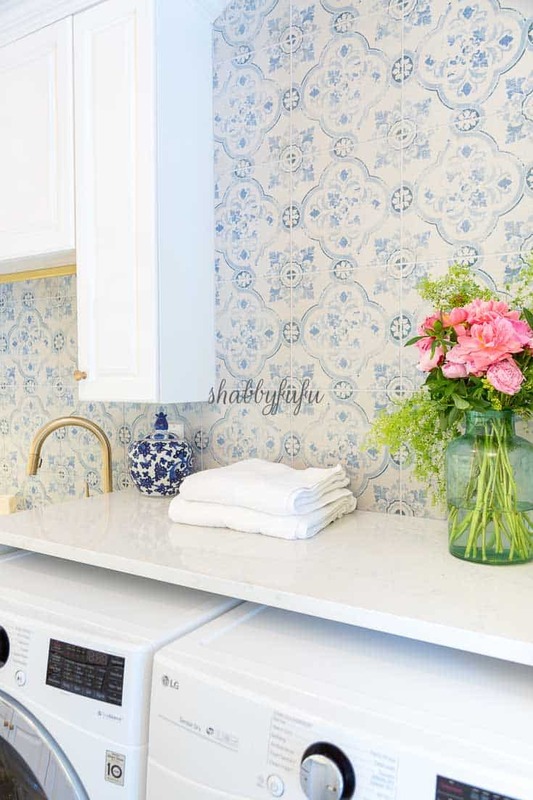 I LOVE how pretty and practical your countertop is over your washing machine and dryer. Those blue and white tiles are amazing! I’m looking for something different to reface my fireplace and you have just opened up some new ideas for me! Thanks!! Thanks Susan! I find myself putting the laundry that needs to be done up there and folding laundry on the other larger counters. So glad that I designed that in. Janet, What a great remodel. I really need to makeover my laundry room. If you come through our garage it’s the first thing you see. I love all of your choices. The Hanstone Quartz is so pretty and I like most of the others who have commented love the blue tile you picked. It must be a joy to do laundry in this beautiful room now. Thanks so much Patti. I’m doing laundry today and find myself actually enjoying it now, lol! Blue and white is the perfect combination for your home Janet. Those tiles give such a high-end look to the room as to make it seem much more than just a laundry room. WHo knows you may want to reclaim it as your art room. Thanks Mary…something to think about for sure, and my art stuff is all over the place! wow!! Your new laundry room is stunning! It makes me actually want to do laundry!!! Love the blue and white tile. Thank you Angelina and I so enjoy this room now! /dryer! I can’t decide! Lol. Anyway you look at it, it’s a great space! I’m so glad that you like the room and that tile really is amazing! Last year we moved our laundry from a dark depressing basement upstairs. It isn’t a full laundry room but a large walk in laundry closet attached to a powder room and it is my favorite part of a small addition to the house. I have a full size stackable washer and dryer and just having everything pretty and upstairs is the best. I love, love, love your laundry room. The shelf over the washer and dryer is so handy and the tile is just gorgeous. Great job and I’m sure you are enjoying it. Thanks for sharing. Thank you Carole and your laundry room sounds lovely as well! We had stackables before, but I wanted more counter space and by doing it this way I got the folding space I needed. Thank you Nancy…so glad you like it!